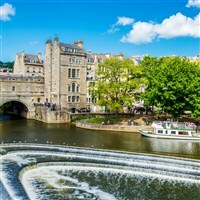 Bath stands majestically on the banks of the River Avon and is steeped in ancient history. The town's outstanding architecture fully justifies its epithet as the 'Elegant City of Golden Stone'. Bath is a designated World Heritage Site, boasting Roman ruins and baths (including the 70ft long Great Bath) and magnificent Georgian architecture. Bath stands majestically on the banks of the River Avon and is steeped in ancient history. The towns outstanding architecture fully justifies its epithet as the Elegant City of Golden Stone. Bath is a designated World Heritage Site, boasting Roman ruins and baths (including the 70ft long Great Bath) and magnificent Georgian architecture. We depart from your selected pick-up point we travel south via Hereford, through Wye Valley, crossing the River Severn and onto Bath. Arriving mid-afternoon you will be free to wander this truly wonderful city before dinner in our hotel this evening. After a leisurely breakfast, you have a morning at leisure in Bath before an early afternoon departure for home, travelling through the beautiful Cotswolds countryside arriving home early evening. · 1 nights accommodation, dinner & breakfast. Situated in the heart of this famous Georgian Town, the Hilton is within easy walking distance of the citys historical sights. All bedrooms have full facilities, restaurant, café, lounge, bars and fully equipped health club. Depart from your local selected pick-up point we travel south via Hereford, through Wye Valley, crossing the River Severn and onto Bath. Arriving mid afternoon you will be free to wander this truly wonderful city before dinner in our hotel this evening. After a leisurely breakfast, morning at leisure in Bath before an early afternoon departure for home travelling through the beautiful Cotswolds countryside arriving home early evening. Situated in the heart of this famous Georgian Town within easy walking distance of the citys historical sights. All bedrooms have full facilities, restaurant, café, lounge, bars and fully equipped health club.